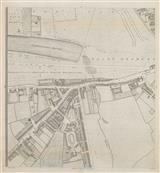 Description: Westernmost sheet of the most accurate late 18th century survey of London centering on the corner of Knightsbridge, Brompton Road and Sloane Street. 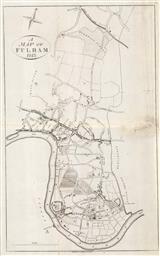 Description: Early and important map of Fulham in West London, showing the Gardens, Fulham Fields, Parson's Green, part of Hammersmith, the King's Road leading to Fulham Palace, and Craven Cottage. Description: Interesting early map of southwest London before it was developed. The areas shown include Knightsbridge, Fulham, Chelsea, Notthing Hill, Kensington Gardens, Earls Court and Hyde Park. Description: Very attractive plan of St. James Park published by Parliament to illustrate its proposed development by Joseph Nash. Original hand colour. Title: : Plan of the River Thames from Westminster Bridge to Blackfriars Bridge, shewing the line of the New Quay as Proposed by Colonel Trench, MP. 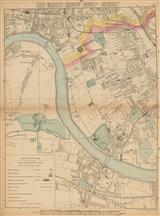 &c. &c. &c.
Description: The River Thames between Westminster Bridge and Blackfriards Bridge, showing Frederick Trench's embankment proposal to improve the city's sanitation and prevent cholera outbreaks. Strong impression. 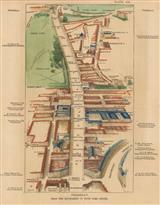 Description: Huge scale plan (5ft to 1 mile) from Kensington Palace to Kensington Gore. Slight marginal damage. 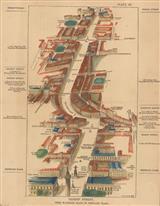 Description: Detailed Victorian street plan of Paddington, Bayswater, Marylebone & Regent's Park. Original hand-colour. Description: Large scale plan (2 ft to 1 mile) of Kensington and Chelsea. Slight marginal damage. Description: Huge scale plan (5ft to 1 mile) of Knightsbridge and Belgravia. Slight marginal damage. Description: Southwest London, including Knightsbridge, Kensington and Chelsea showing areas and houses undergoing development as well as areas still to be developed. Coloured. Description: Regent Street from Waterloo Place to Portland Place, including Oxford Circus. Bird's Eye View. Coloured. Description: Piccadilly, from the Haymarket to Hyde Park Corner, including Jermyn Street, Burlington Arcade, and Green Park. Bird's Eye View. Coloured. 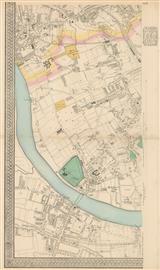 Description: Large sectional street plan of South West London detailing Hammersmith, Fulham & Putney. Coloured.